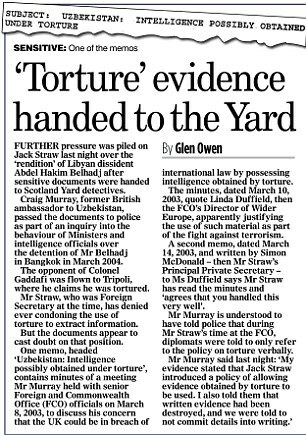 MI5 betrayed enemies of Colonel Gaddafi given refuge in Britain in a covert joint operation with Libyan spies working on UK soil, documents obtained by The Mail on Sunday reveal. Gaddafi’s secret agents were supplied by MI5 with intelligence, secure mobile phones and a luxurious safe house in the heart of London’s Knightsbridge. 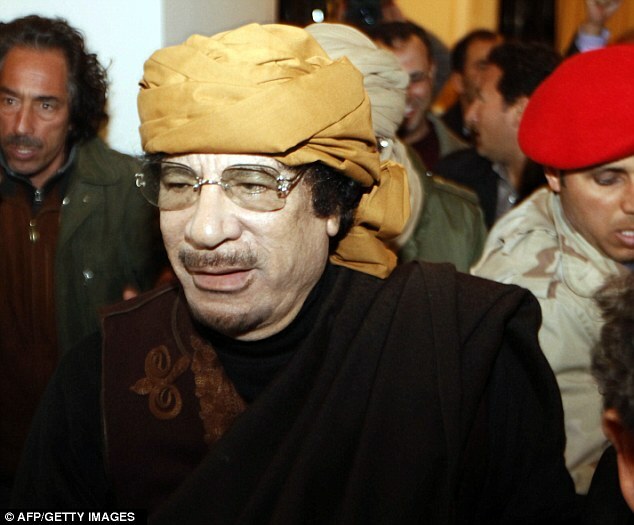 The extraordinary revelations emerge from hundreds of secret documents unearthed from Libyan spymasters’ archives after the Gaddafi regime was toppled – with British military help – last year. Shockingly, they reveal tactics of intimidation and coercion – and expose the British agents’ specific fears that their actions might be reported by the press in the UK. The documents disclose that MI5 betrayed the confidentiality that all refugees are promised when they apply for asylum, and told the Libyans that the targets could be threatened with deportation to Libya if they refused to co-operate. The revelations will cause a political storm. David Davis, the senior Tory MP, said they made clear that the 2004 operation to arrange the ‘rendition’ of former Gaddafi opponent Abdel Hakim Belhadj from Bangkok to Tripoli was ‘merely the start of a continuing intelligence saga’. 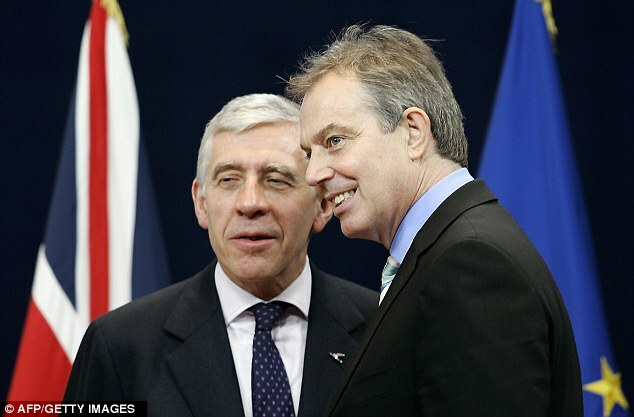 He said it was ‘essential’ that the Scotland Yard investigation into the case of Mr Belhadj – who is suing former Foreign Secretary Jack Straw for allegedly authorising his kidnap and rendition – is extended to include the joint MI5-Libya operations. Experts in refugee law say the documents imply flagrant breaches of the Geneva Conventions on refugees, the Human Rights Act and the ordinary criminal law. Lord Carlile, QC, the former reviewer of UK anti-terror laws, said the allegations were ‘serious’ and called for an inquiry. A senior former intelligence officer said it was ‘difficult to imagine’ that the joint operations were not sanctioned by Ministers and it was likely that the Home and Foreign Secretaries were involved, as well as the Prime Minister – at the time, Tony Blair. But the then Foreign Secretary, Margaret Beckett, said: ‘I don’t think I knew anything about this. I certainly have no recollection of it.’ She thought that as an ‘operational matter’ it would not have needed ministerial authorisation. Lord Reid, who was Home Secretary, failed to return phone calls asking for comment. A spokesman for Mr Blair said he had ‘no recollection’ of the operations. The documents reveal meetings between the British and Libyan services in both Tripoli and London, and visits by the Libyan agents to make ‘approaches’ to their targets in London and Manchester in August and October 2006. They make clear that the Libyans had at least some success, and that some of the refugees they approached did agree to co-operate. MI5, the documents say, wanted then to turn the refugees into sources of their own, in the belief that the body to which they belonged – the Libyan Islamic Fighting Group – was linked to Al Qaeda, and a threat to UK national security. But, according to the minutes of one meeting, MI5 also knew that its decision to do business with a regime that, despite having abandoned its WMD programme, was still torturing and murdering its opponents, was controversial and had to be kept secret. As MI5 had promised, it had left nothing to chance. Waiting for the two Libyan intelligence officers as they got off the plane at Heathrow was Caroline, the charming Security Service operative they knew from her recent visit to Tripoli. No need for the agents to wait in line at immigration: Caroline – whose full name, together with that of other UK officers, The Mail on Sunday has chosen not to publish – met them ‘airside’, and they bypassed the usual formalities. She was carrying two, prepaid, secure mobile phones, one for each of the Libyans, Colonel Najmuddin Ajeli and Ahmed Abdanabi. Naturally, Caroline had organised transport: an MI5 car in which she escorted them to MI5’s safe house – a luxury service flat at one of the best addresses in London, in the heart of Knightsbridge. This was almost certainly in Egerton Place, a brief stroll from Harrods, and less than a mile from St James’s Square, where WPC Yvonne Fletcher was shot by a Libyan diplomat in 1984. Next day, August 10, 2006, the joint operation between MI5 and the Libyan dictator Muammar Gaddafi’s External Security Organisation would begin. Meanwhile, Ajeli and Abdanabi were free to enjoy a night on the town. Details of the two Libyans’ visit are contained in a new and extraordinary cache of documents, classified UK/Libya Secret, unearthed in Gaddafi’s archives after his regime was toppled – thanks in large part to RAF airstrikes – last year. The documents reveal that collusion between the dictator’s security agency, a byword for torture, brutality and murder throughout the Middle East, and its British counterparts was far greater than hitherto realised. The case of Abdel Hakim Belhadj, who is suing the former Foreign Secretary Jack Straw for allegedly authorising his illegal ‘rendition’ from Thailand to prolonged torture in Libya in 2004, has already become notorious. 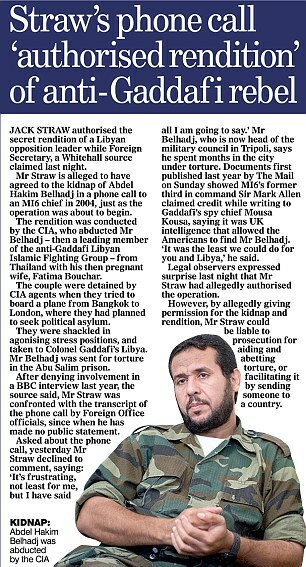 Serious as the Belhadj case is, however, in that instance the British supplied intelligence only about his whereabouts: the actual rendition was done from a distant foreign country by the American CIA. But the new documents disclose that for at least two years after that, MI5 and MI6 developed a close and active working relationship with the Libyans. It extended to flagrant breaches of the law that is supposed to protect political refugees, and ‘joint operations’ in which such people – whose families and friends were vulnerable to savage reprisals in Libya – were cold-bloodedly ‘targeted’ on British soil, where they thought they were safe, by the Libyan service, with direct assistance from MI5. This breaks every convention of acceptable behaviour between governments. ‘When you ask for asylum in Britain, the form you fill in promises that the mere fact of applying will be treated by the British Government as strictly confidential, since if it became known, your friends and family would be exposed to persecution,’ a top QC and refugee law expert said yesterday. The documents contain a detailed narrative of the 2006 operation mounted by Caroline, Ajeli, Abdanabi and their colleagues. It began with a meeting in Tripoli on May 17, attended by X, an MI6 officer stationed in Libya (whom The Mail on Sunday has agreed not to name), Caroline from MI5, and the two Libyans who came to London in August, along with others whose names are not recorded in the meeting’s minutes – which were taken in Arabic by a member of the Libyan service. ‘We are here with you to share some co-operation and suggestions to work with your secret department,’ Caroline explained. Right from the outset, she abandoned any pretence that asylum seekers should be protected. After Caroline left Tripoli, plans were made for the August visit by the two Libyans. MI6’s officer X sent the details of its logistics in a memo to General Sadegh Krema, the head of the Libyan service’s external relations section, on August 8, the day before they left. As well as the safe house and the phones, MI5 would be providing lunch, and a series of meetings to formulate ‘operational plans’ for approaching their main target. The Mail on Sunday is aware of the identity of this person, who was a member of the Libyan Islamic Fighting Group (LIFG) based in Didsbury, in Manchester, and an habitué of the Didsbury mosque, one of the main centres of anti-Gaddafi activity in Britain. We also have the minutes of the meeting held between the Libyans, Caroline, her colleague Tony and other MI5 staff at MI5 headquarters on August 11. MI5 justified its participation in these operations by asserting that the LIFG was a jihadist group with links to Al Qaeda, and hence a threat to UK security – although it is a matter of record that the only Libyan ever arrested or charged with any terrorist offence committed in Britain was not from the opposition at all: the sole example is Abdelbaset Al Megrahi, the Lockerbie bomber freed on compassionate grounds nearly three years ago when he was said to have three months to live. In 2004, the Special Immigration Appeals Commission ruled that the LIFG was only interested in opposing Gaddafi – not mounting terrorist attacks in Britain. A memo dated September 27 from officer X to General Krema makes clear that the August operation had gone well, and suggests further activity against other targets in Didsbury. The Libyan agent Najmuddin Ajeli had ‘established contact’ with members of the Didsbury mosque, and the next step would be ‘joint casework between our services’. On October 14, Ajeli and Abdanabi flew back to Britain. Another unnamed MI5 officer, says a further memo, was due to meet them, though if there were any problems, they could call Caroline. 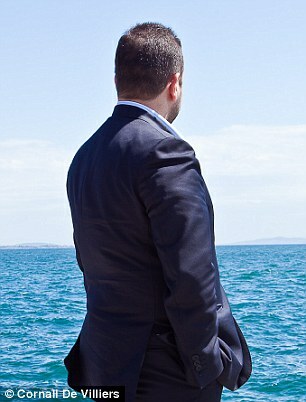 This time, the plan was to set up further meetings with the target in Didsbury, with the hope of introducing him to MI5. 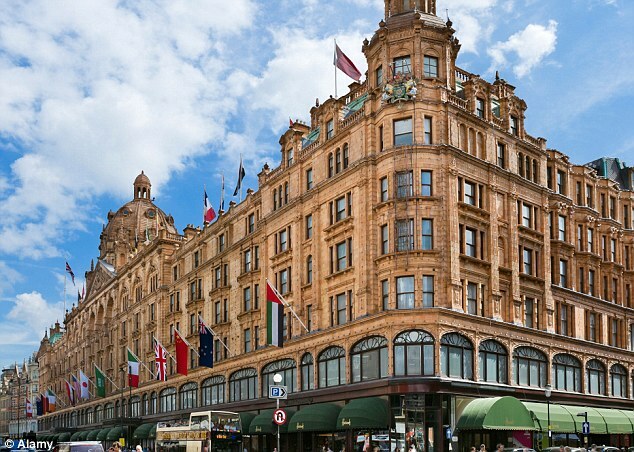 The Libyans were not to stay at the safe house, however, but at the five-star City Inn Hotel, which conveniently is next to MI5’s headquarters on the Thames. There the documentary record ends. But former Libyan dissidents who are now supporters of the revolution say they know of several individuals who were approached by Libyan intelligence and MI5 while refugees in Britain, and threatened in the ways the documents suggest. A Libyan accountant who lived in England for ten years was spied on by British Intelligence working with Colonel Gaddafi’s tyrannical regime. Organisation (ESO) in a sinister exchange that ended only with Gaddafi’s death. He believes one phone conversation he had with fellow Libyan dissident Abu Bakr Ighrebel led to Ighrebel’s arrest, imprisonment and torture for five years in Tripoli’s Abu Salim detention facility. The accountant, who lived in Pinner, North London, wishes to remain anonymous because of security fears for family members in Britain. He was shaken to discover a file containing his personal information and a photograph, which he recalls submitting for his British passport application in 2002, among documents taken from the ESO building after Tripoli fell last year. The Mail on Sunday has seen the file and had it independently translated. A series of internal memos written in Arabic by Libyan agents gives feedback on meetings with their British counterparts. One memo reports a conversation the accountant had in 2007 with Ighrebel, who sought advice about seeking asylum in Britain. Anyone even thinking about helping or god forbid working for MI5, Security Services should read up(search Google) on the cases of former British Agents Kevin Fulton, Martin McGartland and Raymond Gilmore. Each infiltrated terrorist groups (PIRA) on behalf of MI5 (Security Services) but only to be abandoned by MI5 when each had past their sell-by-date. In fact in the case of Martin McGartland MI5 set him up to be murdered in 1991 and again in 1999: http://www.belfasttelegraph.co.uk/news/local-national/northern-ireland/two-exspies-target-mi5-in-landmark-legal-battle-over-payouts-28792426.html – http://www.bbc.co.uk/news/uk-england-19829532 – http://www.channel4.com/news/articles/uk/mi5%2Bunder%2Bscrutiny%2Bnot%2Bfor%2Bthe%2Bfirst%2Btime/3538142.html Do not trust MI5.